No more crumbs! 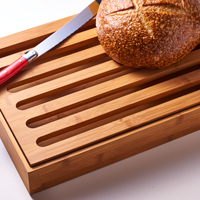 This two-part bamboo cutting/crumb board has a slotted cutting surface that lifts out of a bottom tray. When you're ready, simply dispose of the crumbs in the tray below and you're ready for your next loaf of sourdough! L14" x W9 x H2"